How Sunscreen Can Burn You : Shots - Health News Five people burst into flames last year after spray-on sunscreen ignited on their skin. The manufacturer has recalled those sprays, but the Food and Drug Administration says sprays can still pose a fire risk because they include flammable chemicals. So spray carefully, or opt for a shirt. 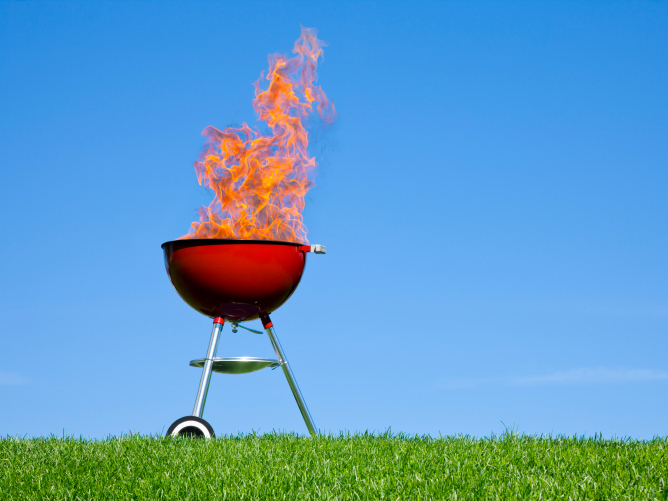 Don't get near that grill with the spray-on sunscreen. That sunscreen you dutifully spray throughout the day could actually get you burned. We're not talking sunburn. We're talking people bursting into flames because they're wearing sunscreen. Last year, the Food and Drug Administration recorded five incidents in which people were burned after their sunscreen caught on fire. One person was hurt after lighting a cigarette. Another stood near a citronella candle. One man in Massachusetts applied spray sunscreen and then went to tend his backyard grill. The flames leapt to his arm, then traveled to his torso. He suffered second-degree burns and was treated in a hospital burn unit. And a woman in Norfolk, Va., applied spray sunscreen, waited several minutes for the product to dry, and then turned on a welding torch, a local TV station reported. "My whole arm went on fire," she told the station. Many spray sunscreens include alcohol or other flammable ingredients. In these cases, the people had used Banana Boat sunscreen sprays. The brand's corporate parent, Energizer Holdings Inc., recalled those products last fall. The problems appear to have been caused by a spray valve opening that "dispenses more than is typical in the industry for continuous sun care sprays," according to the recall notice. We redesigned the delivery mechanism and rigorously tested it through our comprehensive safety and quality assurance processes. New products began shipping in November 2012. But people should be careful with all sunscreen sprays, the FDA cautions. The agency said Wednesday that people should never apply sunscreen sprays near an open flame like a BBQ grill or candle, and not approach a flame until the product has had time to dry completely. Fear of immolation won't get you off the hook when it comes to sun protection, though. The FDA still wants people using sunscreens or covering up to reduce the risk of skin cancer. Lotion-type sunscreens don't post a fire risk. Nor does wearing a hat and long sleeves. To make choosing sunscreen less of a chore, last year the agency issued new regulations aimed at making the SPF ratings on sunscreens simpler and easier to understand. Sunscreens need to be rated at SPF 15 or higher and labeled "broad spectrum" to claim that they protect against both sunburn and skin cancer. The FDA also proposed that SPFs go no higher than SPF 50, because the agency thinks there's no evidence that SPFs higher than that grant more protection. But that rule has not been made final. In a previous version of this story, we attributed information about the Banana Boat spray valve's problem to an email from the company. That information was actually in an online corporate recall statement and an FDA recall statement. We also previously implied that a ban on SPFs higher than 50 was included in the final regulations, but it is a proposal that has not been made final.